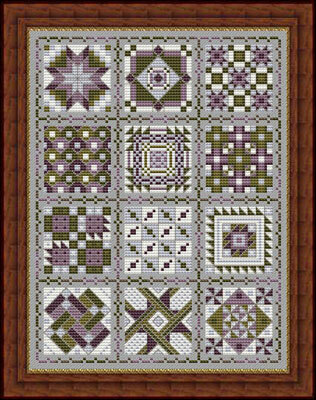 "Friendship Quilt IV for Herbs and Spices"
This design consists of 20 quilt blocks. 12 are needed to complete the design as shown. The design can be stitched as presented or the quilts blocks can be replaced with your favorites. or each quilt block can be stitched individually as an ornament. There are 5 herbs and spices color palettes to choose from. Basil color palette is shown above, others include: 'Marjoram', 'Paprika, Parsley & White Pepper', 'Thyme', 'Cinnamon, Cloves & Ginger'. 14/28 ct. Twilight Blue / Smoky Pearl Jobelan (stitched 2 over 2) from Wichelt Imports. Alternative fabrics: Aida substitute is not recommended for this design. As shown the design area is approximately 6 1/4" x 8 1/4"
This design is a companion to ' Friendship Quilt For All Seasons' , 'Friendship Quilt II for Landscapes' and 'Friendship Quilt III for Flowers' . copyright © 2004 Whispered by the Wind, LLC.